Okay, I take back everything I said about Santa Ride! and Santa Ride! 2 (but not what I said about Die Hard Trilogy). 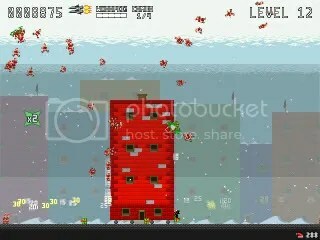 This time, I swear to God, Garden Gnome Carnage is the best Christmas-themed game I’ve ever played. 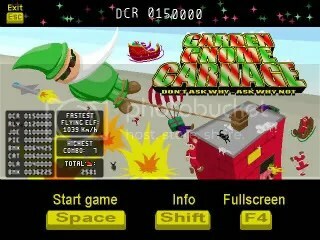 Well, technically, I hadn’t ever played Garden Gnome Carnage before, so what I said about Santa Ride! was true, from a certain point of view. kentdog engages in hyperbole; it’s a first. Move your skyscraper back and forth, swinging the Gnome into the Lemming-esque elves that assault your tower with the gift of giving. Grab explosive bricks from your building and fling them into crowds of hapless elves. If things get too hot, call in an airstrike for mass destruction. Score multiple hits for combo bonus. 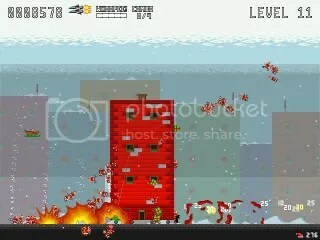 Win bonus from me just by playing this game. Pass it around the office. It’s this years Elf Bowling, I swear.